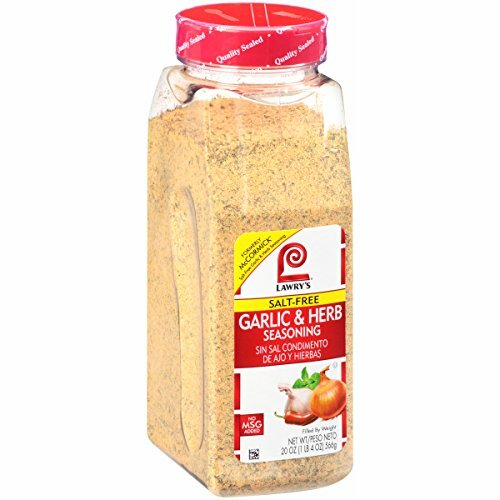 Turn up the flavor without adding salt with Lawry's Salt Free Garlic & Herb Seasoning, a premium blend of spices and herbs, including oregano, rosemary, basil, and red pepper, with a touch of citrus. Specially made for chefs to inspire extraordinary menus and deliver consistent recipes. Use in place of salt for reduced sodium dishes. Add to potatoes, chicken, tuna, pasta, salads or eggs for a fresh, herby flavor. Lawry’s is restaurant-proven flavor featuring a premium selection of unique rubs, mixes and seasoning blends for the center-of-the-plate. Once used exclusively for prime rib, from the Lawry’s Prime Rib restaurants, the Lawry’s portfolio has expanded to serve the evolving tastes of customer’s, as well as the culinary innovations of today. Chefs can be sure to find inspiration for your menu with Lawry’s, flavoring proteins made easy.